latest issue and explore back issues in our online vault. 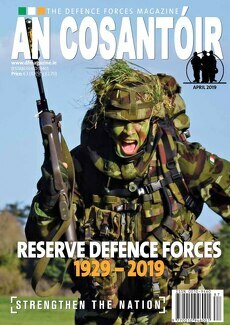 An Cosantóir is the official magazine of the Irish Defence Forces. First published in 1940, An Cosantóir provides, in print format, accurate and timely information about Defence Forces operations and policies to its members, their families and interested parties worldwide. A typical issue may contain articles dealing with new equipment, training, overseas service, unit and individual activities and achievements, international military affairs, military history, sport and much more. An Cosantóir is distributed monthly to a readership of approximately 25,000. Sold in 191 Outlets nationwide including 41 Eason & Son bookshops and 38 Tesco Extra/Super Stores around Ireland. An Cosantóir has won the European Military Press Association’s ‘Best Article 2013′, with ‘At the Gates of Hell (Mali)’ - written by Irish Author & Military Historian, Paul O’Brien. An Cosantóir has been shortlisted for The Media Pioneer Awards 2013, to celebrate innovation and entrepreneurial spirit in specialist media markets. An Cosantóir 10K fun run will be held in The Phoenix Park on the 10th of October 2018. The Entry fee will remain €10 per person. The deadline for applications is the 3rd October 2018. No entries will be accepted after the deadline date. Entry on the day will be €5, but, entrants will not be timed and will not receive a goody bag. The race is open to all PDF, RDF, DoD, retired and invited personnel. All cheques/postal orders made payable to An Cosantóir. TIMINGS: Race numbers can be collected, from 11:00am in Gymnasium McKee Barracks, on the day of the race. Blocks start at 12 noon and teams/runners/walkers at 13:30pm. Prize Giving Ceremony at 15:30pm.